Can I really have my cake and eat it too?!? 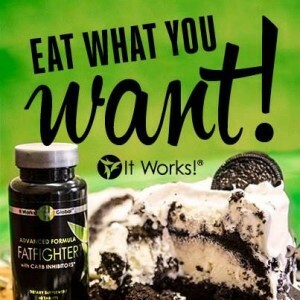 It is amazing how the It Works Fat Fighter work to helps absorb some of the fat and carbs in a heavy meal. How do The Ultimate Fat Fighters work?Fat Fighter contains NeOpuntia, the most powerful fat binding ingredient on the market today. NeOpuntia is derived from a vegetable known as the prickly pear cactus fiber. In addition, Fat Fighter contains Phaseolamin, a white kidney bean extract that acts as a carb inhibitor and also aids in weight loss. The natural ingredients make Fat Fighter safe for daily consumption, and this product is also gluten free! This special cactus fiber blend actually grabs the fat and carbs and takes them out of your system while they are still in your stomach. Simply take 1-2 Fat Fighters about 15-60 minutes after a meal high in fat and carbs. Powered by NeOpuntia™ (a naturally based ingredient made from the “prickly pear” cactus) and the It Works! Proprietary blend, Advanced Formula Fat Fighter delivers dynamic, clinically tested results for both men and women. It is important to take your Fat Fighter 15 to 60 minutes after you ingest your largest meal of the day. The NeOpuntia binds to the fat and stops it from being absorbed into your body and it will then be harmlessly eliminated from your system. Can I take Fat Fighter every day? Fat Fighter is a vegetable-based product with minimal side effects and is safe for daily use. When is the best time to take Fat Fighter? One to two Fat Fighters should be taken 15 minutes to 1 hour after eating your two largest meals of the day or after snacks with a higher fat content. Maximum of 4 Fat fighters per day. Can I take Fat Fighter before I eat? No, Fat Fighter is designed to be taken after a meal (or snack) to be able to bind to a portion of the ingested fat as it starts to break down in the stomach. Can I take them with other supplements or medications? Is Fat Fighter like other products I’ve used that caused me to make frequent trips to the ladies room? Typically, Fat Fighter will not cause you to use the bathroom more frequently. This is a great sister product to the Ultimate Thermofit.